Choux pastry cases filled with stabilised cream and a pot of Swiss chocolate sauce. Cream (Milk), Swiss Chocolate Sauce (31%), Pasteurised Egg, Wheat Flour (Wheat Flour, Calcium Carbonate, Iron, Niacin, Thiamin), Rapeseed Oil, Dextrose, Milk Proteins, Stabiliser (Pectin), Sugar. Swiss Chocolate Sauce contains: Sugar, Partially Inverted Sugar Syrup, Palm Oil, Cocoa Mass, Cocoa Butter, Cream (Milk), Evaporated Milk, Water, Dried Whole Milk, Rapeseed Oil, Coconut Oil, Milk Sugar, Fat Reduced Cocoa Powder, Anhydrous Milk Fat, Dried Skimmed Milk, Emulsifiers (Mono- and Di-Glycerides of Fatty Acids, Soya Lecithins), Whey Powder (Milk), Dried Glucose Syrup, Dextrose, Milk Proteins, Barley Malt Extract, Vanilla Powder, Flavouring, Concentrated Lemon Juice, Stabiliser (Pectin). 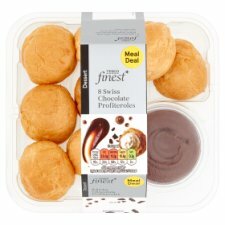 Profiteroles are not suitable for heating. Remove lid from sauce pot and place on a microwavable plate. Heat on full power. Leave to stand for 1 minute after heating. Stir before pouring over profiteroles.